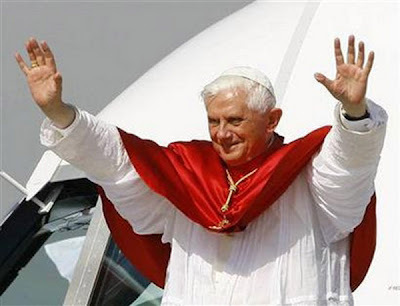 Pope Benedict XVI is to visit New York for a three-day visit in April -18th. to 20th. This would be Benedict's first visit to the United States as Pope. Included in Pope Bededict's visit will be a speech made to the United Nations on April 18, a mass on April 19 at St Patrick's Cathedral and a larger outdoor mass at Yankee Stadium on April 20. According to a reports, "the Pope’s first-ever US visit (will) include, New York, Washington, Boston and possibly Baltimore." CNA said the "tentatively scheduled April 15 to 20 trip is centered around a papal speech before the United Nations General Assembly in New York. Secretary General Ban Ki-moon personally invited the pontiff to address the UN." "Sources familiar with the plans for the papal visit say that the pontiff will visit New York, where he will celebrate Mass at Central Park, give an address in St. Patrick's Cathedral, and pause for a moment of reflection at Ground Zero .... The trip, however, will reportedly begin in Washington, where the Pope is expected to meet with the president, visit Catholic University of America and say Mass on the National Mall. " The last stop is Boston, where the Pope is expected to address the sexual abuse scandal and to end his visit with a Mass on Boston Common. Recently, it was reported that following an Oct. 18 meeting, Bishop William S. Skylstad of Spokane, Wash., conference president, was unable to provide specifics about the trip because 'the details have not been nailed down yet.'" There have been growing expectations over the Pontiff's first visit to the United States. The Pope could "use his first address to the United Nations to deliver a powerful warning over climate change in a move to adopt protection of the environment as a "moral" cause for the Catholic Church and its billion-strong following." Citing diplomatic sources, the Pope's UN speech "is likely to contain an appeal for sustainable development, and it will follow an unprecedented Encyclical (a message to the wider church) on the subject." I really hope the Pope doesn't take up the global warming cause. I think the Church has much bigger and more important issues to address.